the Decline of the four parties are at a total of 5.1 percentage points. 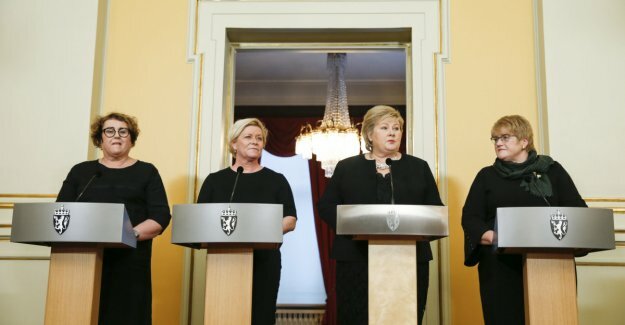 With an overall turnout of 40.9 percent, according to NRK, the lowest total in the four parties have had on Norstats measurements since Erna Solberg (H) was the prime minister. the Survey is done in the period 29. January to 4. February and based on 937 interviews. Error bars are from 1,1 to 3,5 percentage points. The three other parties falling just a few tenths of a percentage point, and ends with an attendance of 12.0 per cent for the conservative party, 3.4 per cent for the Sector and 2.6 per cent for the Left - the last two still under sperregrensa. Among opposition parties surging Labour party up, by 1.9 percentage points to 29,2 per cent. Red goes up 1.5 percentage points, passing sperregrensa and ports of 4.8% was reached.